My mother was admitted for skilled nursing care and therapy following a week hospital stay. What a pleasant experience to find all the staff VERY friendly, cheerful and very efficient and capable. All the nurses and assistant techs were extremely friendly and cheerful. Thank you very much! Prestonwood Rehabilitation hires only the best employees. All employees must complete an application, provide references and pass a background screen. Pre-employment drug screening is required for sensitive positions, and random drug screening may be conducted with all employees. Prestonwood Rehabilitation may be hiring for the following positions. Please call to verify current openings. Click here to download our application. 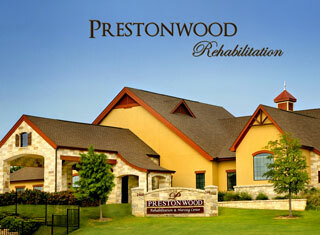 You may e-mail your application and resume to employment@prestonwoodrehab.com.